Bring four-star fare home with this Bananas Foster Cheesecake Squares recipe. 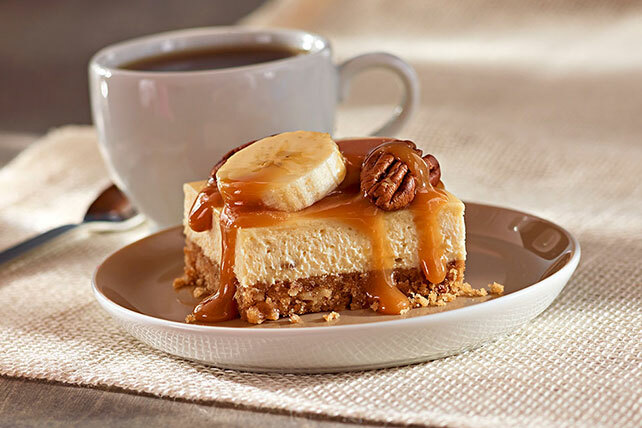 With just 20 minutes of prep you can enjoy tasty Bananas Foster cheesecake! Combine wafer crumbs, chopped nuts, butter and 1/4 cup sugar; press onto bottom of 13x9-inch pan sprayed with cooking spray. Beat cream cheese, rum extract and remaining sugar in large bowl with mixer until blended. Add eggs, one at a time, mixing on low speed after each just until blended. Stir in mashed bananas; pour over crust. Bake 30 min. or until center is almost set. Cool. Refrigerate 3 hours. Slice remaining bananas; toss with lemon juice. Spoon over cheesecake. Microwave caramels and milk in microwaveable bowl on HIGH 2 min. ; stir until caramels are completely melted and sauce is well blended. Drizzle over cheesecake; top with pecan halves. Balance out your choices throughout the day so you can enjoy one of these delicious cheesecake squares. When serving adults, substitute 2 Tbsp. dark rum for the rum extract if desired. Stir additional 1 tsp. rum extract into the caramel sauce before drizzling it over the chilled cheesecake.